The SignTool alternative! 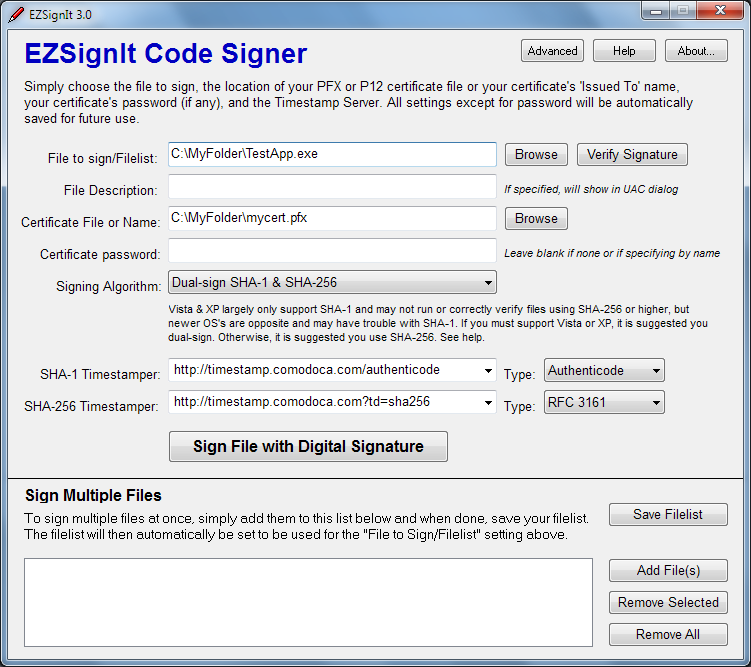 EZSignIt is a FREE, redistributable digital code signing program that operates via GUI interface or command-line. Unlike other programs, it does NOT require Microsoft's SignTool (signtool.exe) although it can optionally use it if you'd like. It supports SHA-256 and dual-signing, can sign multiple files at once (and save the list for future signing), remembers many of your last used settings, and can automatically back up files before signing for auto-restore in case signing fails. Comes with full help and guidance. Code signing is MUCH easier with EZSignIt! EZSignIt was originally developed as part of the SSE Setup Installer Platform to provide signing for SSE Setup created installers since SignTool is not redistributable and there were no other suitable options available. While developed for, and included with, SSE Setup, the standalone tool has been released as freeware to benefit the entire developer and codesigning community. EZSignIt uses the same underlying signing methodology as SignTool does and is safe to use. Even if you choose to use SignTool to actually sign, EZSignIt can easily provide a GUI interface for it as it knows SignTool's command-line structure and will pass it the appropriate settings. No spyware, adware, viruses, or malware of any kind. See the redist.txt file after installing/downloading for redistribution conditions.